Comparing a 13MP camera and an 8MP camera might seem like comparing the strength of a heavyweight and a lightweight boxer, but higher resolution doesn't necessarily mean better image quality. Both phones use customized camera interfaces, but they are pretty similar in terms of both look and functionality. You get a column of customizable shortcuts on the left and another bar with the shutter key, the still camera/camcorder toggle and a gallery shortcut on the right. Both the LG Optimus G Pro and the Samsung Galaxy Note II can shoot panoramas, HDR photos, burst shots, and take photos during video capture. They also offer face detection and a voice-activated shutter. The Optimus G Pro has that humpback volume rocker that can be used as a hardware shutter key. A cool option that LG has added is the so-called Time machine camera. It continuously snaps photos in the background, waiting for you to press the shutter. And when you do, it saves several of the photos captured before you pressed the shutter and several after. This way you can capture the right moment even if you don't have cat-like reflexes. Another feature the Optimus G Pro has over the Galaxy Note II is the VR Panorama. It's basically another name for Google's Photo Sphere mode. You snap one central photo and then move the phone around to fill out as much of the sphere as you want, blue rectangles appear to guide you. Since Galaxy Note II will be getting the Android 4.2.2 update, the Google's Photo Sphere will become available on its camera as well. The LG Optimus G Pro produces very nice and sharp 13MP samples. The conservative noise reduction makes sure much detail is preserved, but results in noisier shadows. Furthermore, the noise gets even more intrusive because of the sharpening, which emphasizes it. The regularly underexposed shadows don't help matters much either. The 8MP camera of the Samsung Galaxy Note II has pretty similar per-pixel quality to the Optimus G Pro, but the lower-res sensor means it can't quite keep up with its rival. Still its noise reduction is better though and the noise levels are much lower in the shadows. The shadows sometimes get underexposed too, but not as often as on the Optimus G Pro. The Galaxy Note II offers slightly oversaturated colors, while the samples from the Optimus G Pro look more natural and close to the reality. Some users would prefer the pumped up colors, but the more natural output will probably be the choice for most. We should note that both cameras have virtually the same field of view. Here are the full resolution camera samples if you want to take a look a better look and do some pixel peeping yourself. We should note that those were not taken at the same time, but the lighting conditions were similar enough to give a good idea of the photo capabilities of the two smartphones. Pixel peepers can also head over to our Photo compare tool. Take a close look at the synthetic resolution chart (the first one), it tries to gauge the captured resolution for cameras. 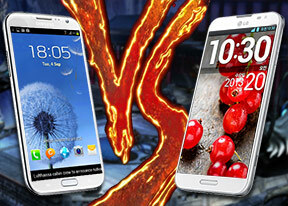 The LG Optimus G Pro has a slight advantage there, but it's no nearly as great as the resolution difference suggests. Winner: LG Optimus G Pro. Both cameras turned out to be very good, but the LG smartphone made the extra resolution of its sensor count.